Chelsea’s clinical dismantling of Manchester City in their 1-0 win at the Etihad, a scoreline that flattered the hosts, will have given Manchester United boss David Moyes plenty to think about ahead of what’s sure to be a busy summer for the Scot. Man Utd are all the way out to 7/2 to qualify for the top four this term and 13 points behind their pair of blue counterparts, which is hardly surprising considering the glaring gaps in the champions’ squad. Chelsea lined up in a 4-3-3 formation and each of their three defensive midfielders would walk into United’s side at present, while injured City spoiler Fernandinho’s reputation swelled out of all proportion in his absence. Moyes’ side’s 2-1 loss at Stoke may have been largely put down to unfortunate injuries at the back by the former Everton chief, as centre-halves Jonny Evans and Phil Jones joined Rio Ferdinand in the treatment room. However, as Jose Mourinho showed against City, a solid screen immediately in front of defence, such as the one provided with distinction by David Luiz and the brilliant Nemanja Matic, is as important in the quest for clean sheets as a settled back four. United currently have, at a stretch, one player that can perform the holding role to an acceptable standard, but Darren Fletcher has barely made 30 appearances in the last 36 months and the former Scotland captain’s problems with illness look to have taken their toll. With this in mind, the Old Trafford faithful will be cheered by reports linking their ailing club with a move for Newcastle enforcer Cheick Tiote. The 41-cap Ivory Coast international has rediscovered the form that saw him linked with a host of the continent’s top clubs after Newcastle finished fifth in the Premier League back in 2011/12. 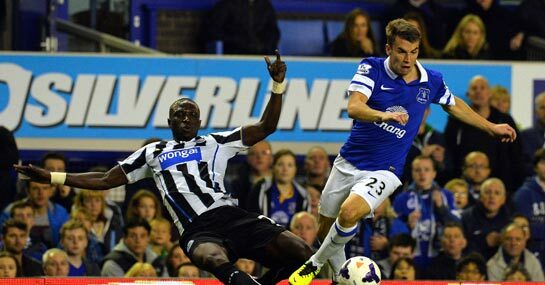 Tiote’s reputation suffered as the Geordies battled relegation last term, but this season he’s made more tackles than United midfielder’s Michael Carrick and Tom Cleverley combined, while still reaching his intended target with 87 per cent of his passes. While it is yet unclear how much Newcastle would demand for the 27-year-old’s services, any fee is likely to be well under the £37m quote currently being bandied about with regard to another of Moyes’ prospective midfield targets – Sporting Lisbon youngster William Carvalho. With United clearly in need of quality and quantity in the centre of the park, it would be no surprise were they to land both.